This model is the Flight Director Attitude Indicator for the Apollo Lunar Excursion Module, it is 1:1 model with Replica face and ball. 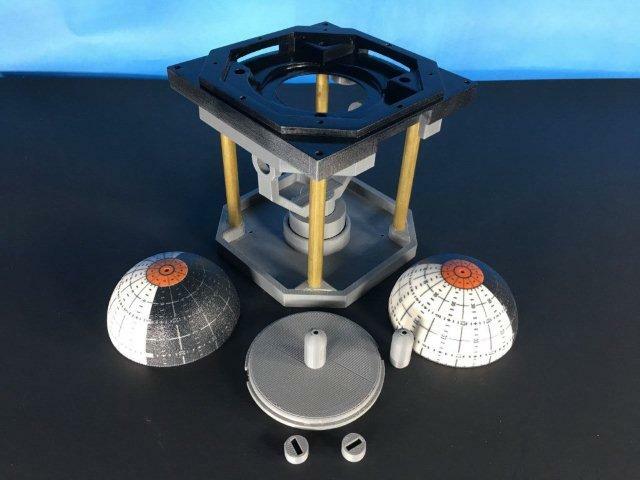 The external dimensions match the actual FDAI so this will fit in your replica LEM or Control Panel if it is accurate. You could put this on its side, make the cover and prop it up or just use it to demonstrate how the FDAI worked. The kit is not sanded, glued, or painted but includes artwork, needles, pointers, covers, brass components, and everything pictured. The 8 ball is 3d printed as are the rest of the parts. The bearing surfaces are plastic and brass in this model.The ball has a rough texture because of the material it is printed in but you can sand and coat it with a clear spray for a different texture. The 8 ball is printed with the graphics through the interior so they will not sand off, they are molded into the model. If this bothers you you can make your own hemispheres, and sell them to me. THIS IS NOT THE MOTORIZED VERSION. This version could be motorized but many of the pieces would have to be modified or replaced so it is best to pre-order that model if you want your FDAI to move under computer/AGC/Internet control. The module is 3D printed in ABS and sand and is accurate to the NASA/Honeywell external dimensions. This is a replica kit and is not assembled or painted. If you want it sanded, finished and painted, this is another fee. Your delivered part will have various corrections and parts not pictured as the corrections are discovered. The pictured part is a prototype and your delivered part will be more accurate and improved. The black faceplate is to show the finish you can achieve but your unit will not be painted or puttied, or sanded. It sure is dusty though, sorry about that! Because this is a kit, and printed as ordered, it takes up to 14 days to get the kit ready to ship. This is because the 8 ball is printed under contract and there is sometimes a waiting list. This pictured item can ship today if you want what is in the picture and I have enough parts to ship this 1 unit. You should allow 3 days for processing to allow for weekends and holidays. If you want this kit assembled and painted, this can be done for an additional fee, typically another $250 and an additional 14 days as it takes 3 days for each coat of paint to cure to maximum hardness. This is a custom item, classified as "Custom Made" and "Artwork" and as such is not covered by the EBay and Paypal buyer protection, also not most credit cards don't have a dispute process for "Art" . There are technically no refunds, but if the kit hasn't been started or damaged and all the pieces are there, I can sell it for you but it has to be in the same new condition you received it in. If you opt for the painting of this kit, touch up is easy if you scratch the paint. The item is printed in whatever color is in the next available printer that day (usually it is gray). Sometimes it is black, white, or green, but the primer is gray, black, or red, so touch up can be often done with a sharpie. This 3D printed part is manufactured on a commercial Stratasys printer so it is going to be more precise than one printed on a consumer grade or home/hobby/school printer. There may be various scrapes and sanding marks for testing the fit and geometry so this should be expected.